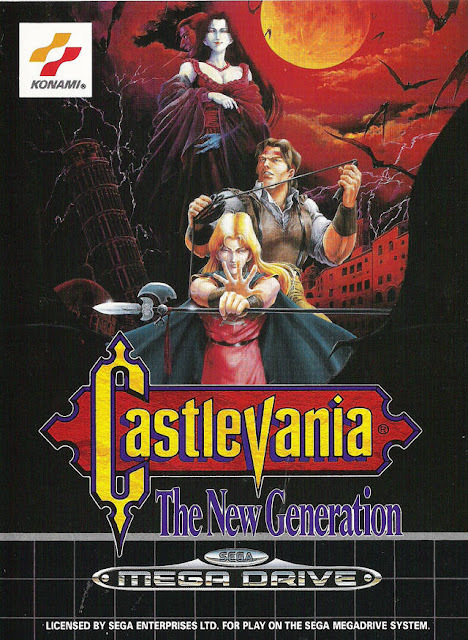 Way back in 2008 when my blog was a little baba I did a blog post about Castlevania: The New Generation (known as Castlevania: Bloodlines in America, and Vampire Killer in Japan) but now I have finally gotten around to doing an actual review. The PAL release was sadly censored quite a bit with blood effects removed and the zombies changed from pink to green among other shames. I adore the Castlevania series of games and this one is notable for a couple of reasons. First off it was the only one to ever be released on the Megadrive/Genesis, and secondly it is one of the only games in the series that doesn't take place in the one location, instead this spans the length of Europe. 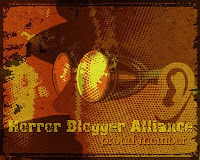 The year is 1917 and you play as one of two vampire hunters - either John Morris or Eric Lecarde who are pursuing female vampire Elizabeth Bartley across Europe as she puts into motion plans to resurrect her uncle; Count Dracula. You get to choose the character you play at the start. Morris has a whip and is able to swing across chasms, while Lecarde is armed with a spear that he can use to propel himself into the air. These differences mean that at certain points there are alternate routes making for small differences. While that sounds cool in actuality there are only two different divergences in the whole game as far as I can tell. I love the mythos of this series; how Death is Dracula's ally as he is the only person Death cannot claim, how Castlevania itself is the physical manifestation of chaos, as well as the many reoccurring monsters and locations that keep appearing in each game. The New Generation plays much like the old ones did. This is a 2D side scrolling platformer with each of the six different levels made up of a variety of short stages. Usually the whole game is your assault on Castlevania. This time the different levels all feature elements that would normally be in the castle setting. Starting off in Romania in the ruins of Dracula's castle your adventure takes you to the lost city of Atlantis (that closely resembles the usual flooded dungeon areas), the Leaning Tower of Pisa, a German munitions factory (that incorporates elements of the iconic clock tower setting), the Palace of Versailles in France, and finally to England to a fictional castle where the show down with Dracula occurs. Each level brings with it its own attractive features. Atlantis has reflective water effects for instance, while Pisa has impressive (at the time) rotating levels, while the final level has some cool effects such as one stage that has the screen split into three disjointed images making for some tricky platforming. Aside from the simply brilliant music (by Michiru Yamane who went on to score Symphony of the Night) the biggest stand out feature is the enemies and specifically the many boss fights. All the classic monsters appear, from the watchers to bats, skeletons, zombies, and medusa heads. Some even interact with the environment such as the minotaurs who rip pillars off the background in Versailles. Most levels have both a end of level boss as well as a mid level one. These are all varied taking in a lot of different foes. The first level for instance sees the appearance of a hell hound whose roar cause glass to shatter from the windows around you, later on a magician who causes water to constantly rise up from the floor adds in a different kind of challenge. Each of the six main bosses are also inventive using some cool effects to make them stand out from traditional 2D graphics, such as the level one and level four bosses who both have elements of 3D to them. It all culminates in a thrilling boss rush of sorts when you fight Death, followed by Medusa, and then onto a fight with Dracula himself that starts traditionally enough with him teleporting around the screen, and ends with you literally whipping the flesh off of his demonic form. Even playing now some 23 years on The New Generation still stands up as a solid entry in the series, it has great music, great level and enemy design, and more importantly it is fun to play, with some nice variations to make each of the levels feel unique. I guess any complaints I have is that there really is not much difference in the two characters you play as, but other than that it's all good. I love the ability to level up your weapons, while the sub weapons such as axe and holy water all as effective to use as ever. Plus there is a neat password system (was a pain back in the day but nowadays with easy access to a camera it's fine) and fair check pointing (even if you use a continue you will still be placed where you died rather than be made to restart the level). 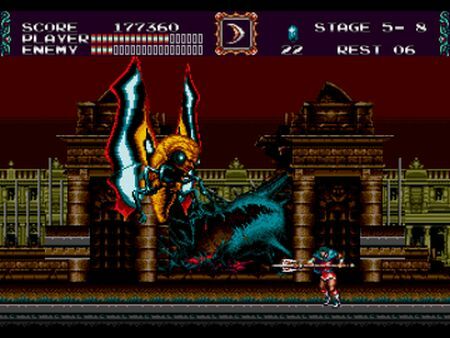 Castlevania might have only had one appearance on the Megadrive but it was a good one.